It’s fun to share my favorites at epoca! New to the gallery is this very cool and shimmering 8-light chandelier by Swedish glass designer Carl Fagerlund for Orrefors Glassworks. This circular chandelier has eight pie-shaped curved and textured crystal segments supported by a brass fixture. 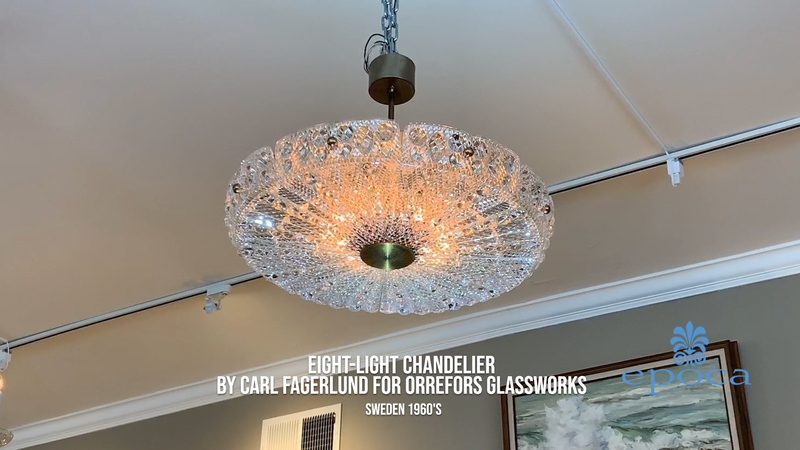 Carl Fagerlund was internationally recognized for his unique and cutting edge lighting designs at Orrefors Glassworks during the 1960’s through 70’s and I’m proud that we have a great example to share with you. Come and see this chandelier at 1700 16th Street, San Francisco at Kansas. That’s epoca and the new home of Garden Court Antiques. See you soon! Fagerlund is internationally recognized for his unique and cutting edge lighting designs at Orrefors Glassworks in the 1960-1970s. He honed his craft in Stockholm, Sweden. After training at Stockholm A.C.S., he qualified to become a designer teacher. Fagerlund went on work for Orrefors Glasswork, famous company known for its exceptionally high quality crystal and art glass. Fagerlund worked begin at Orrefors in 1949 until 1980. He designed dazzling lighting pieces in organic and geometric constructivist style. His designs are often characterized by thick, textured crystal.